Jhalmudi is a light and delicious breakfast item for those who don’t like to have anything heavy in the morning. Very popular in Bengal, this item is eaten as a snack too. 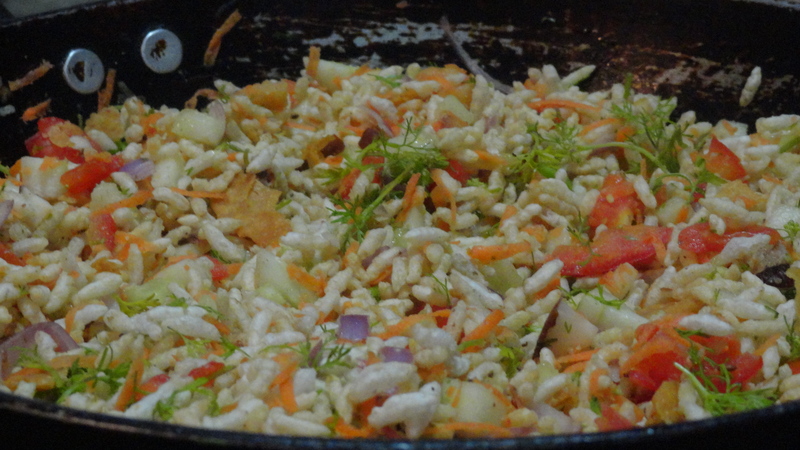 This is very easy and quick to make and looks very similar to Mumbai bhel with a slight difference of ingredients and flavor. Dry roast the cumin seeds and coriander seeds in a pan on low heat until they are aromatic and well roasted but not blackened. Dry roast bay leaves separately on low heat and crush them with hands. Put all the ingredients of mudi masala in grinder and grind into a fine powder; also add in crushed roasted bay leaves and keep aside. Tip: You can make this mudi masala in advance and store in an air tight container to be used later when required. Take a big bowl and combine all of the ingredients in it including mudi masala and mustard oil, mix all the things well and serve immediately. Tip: Serve it immediately after mixing as it might become soggy soon.